A high energy, carbohydrate based drink with added electrolytes formulated to fuel your body and sustain your energy whenever you need it. 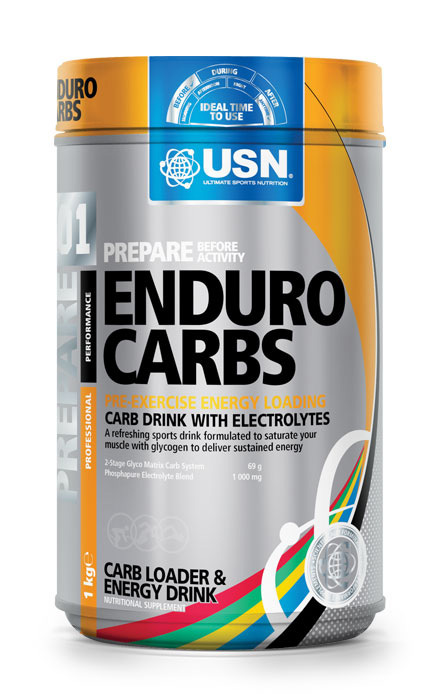 USN ENDURO CARBS represents a new benchmark for carbohydrate loading beverages. Carbohydrate Loading Strategy: Carbohydrate-loading is a strategy which should be employed by endurance and pre-competition body-building athletes in the last 2-3 days prior to events to maximise the storage of glycogen (and water) in the muscles. Carbohydrates are stored as glycogen in the muscles and liver. During long endurance events, an athlete will derive between 80-90% of their energy from carbohydrates, mostly from the muscle glycogen stores. Body-builders should initiate carbo-loading to increase their muscle size and density prior to competition, especially as each gram of glycogen is stored with 2.7g of water. As endurance training is the primary stimulus for increased muscle glycogen synthesis, it is recommended that the athlete complete a short, high-intensity training session 3-4 days prior to the event, draining glycogen from the stores, and then taking the first high-carbohydrate meal within the 4-6 hour window period after this session. Antioxidants help to fight free radicals, which are formed during intense exercise, causing fatigue and the breakdown of muscle tissue. Enduro Carbs also boosts optimum levels of electrolytes, phosphates and minerals to optimise storage and performance.